Two screen are better than one. Own an iPhone 7 Plus? If so, you really need to back this Kickstarter project to make what is already a good phone even better. Oaxis (whose WatchPoone we reviewed here) are famous for making phone cases with small e-ink screens on the back. 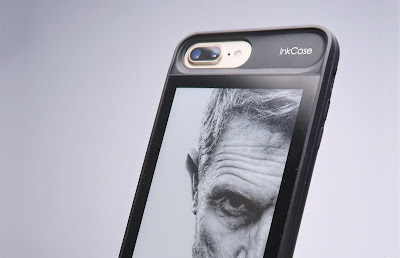 But their latest product, the InkCase i7 Plus, steps everything up a notch to utilise the iPhone 7 Plus' huge real estate. Its like having an eReader on the back of our phone. The Oaxis InkCase i7 Plus features a 5.2 inch e-ink screen, so the same type of thing you have on your Kindle. This means it is thin and uses very little power. Connected to your phone via Bluetooth, it can receive images, eBooks, photos, display customisable widgets (like an Android phone - just saying) and even have news stories pushed automatically to it. As the screen is e-ink it is far more comfortable to read text over long periods than doing so on your phone's screen. The widgets let you set things like a clock that is always there, calendar reminders, and notes - all just sitting there at a glance. Oh, and the case itself will protect your iPhone 7 Plus as is it made BubblePro plastic and is waterproof, too. And hey, selfie fans... the Oaxis InkCase i7 Plus will also let you use you main rear camera for taking selfies, as the screen will show you what the camera sees to help you line up the perfect shot. Bonus.